This shop #PackedWithSavings has been compensated by #CollectiveBias, Inc. and its advertiser. All opinions are mine alone. How often do you go shopping with grocery coupons and end up at the register wondering what is for dinner? This happens to me all the time, I am so focused on getting the deal that I really have done any menu planning. 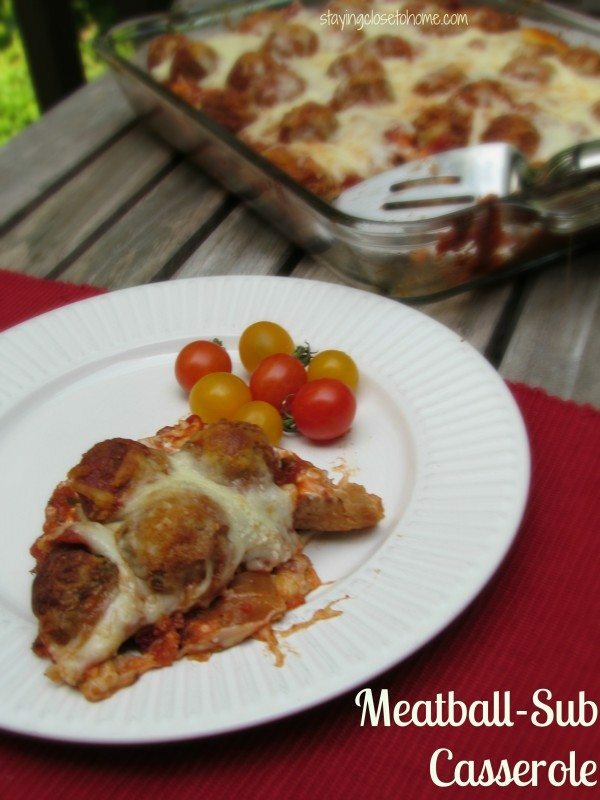 This week I decided to use Kraft Coupons and create this inexpensive Meatball Sub Casserole. The kids will be off to school soon and the weather will be turning cool as well. Actually this has been a cool summer for Central Virginia that I have had my oven on more than I would have thought. I digress sorry, cooler weather usually means our family seeks out comfort food. Nothing more comforting than a warm and cheesy meat ball sub. 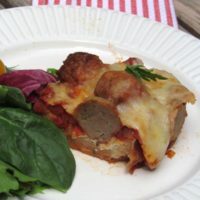 I had seen some recipes on Pinterest and decided to adapt a few of them to come up with our own Inexpensive Meatball Sub. 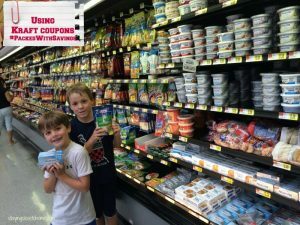 We headed to Walmart with our printable grocery coupons from Kraft #packedwithsavings campaign and the boys were actually helpful locating the items on our list. 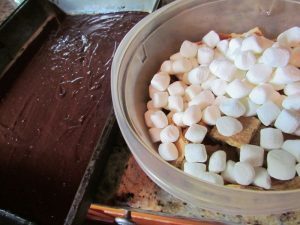 We picked up Kraft Shredded mozzarella, Kraft Cream Cheese, some Capri Sun Juice boxes, and my daughter picked up JET-PUFFED marshmallows, HONEY MAID, and HERSHEY’s for a dessert she found on Pinterest. We will post about that later but here is a teaser of the ingredients we used. Into the kitchen for this easy dinner prep and some meatball subs. 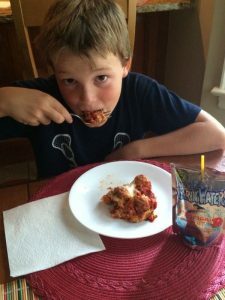 My kids love meatball subs but with busy school schedules I don’t want to make them all night long. This way the Meatball Casserole is done and they can grab a slice or two when they have the time. First cut the Italian Bread loaf, only $1 at Walmart into 1 inch slices. Told you this is inexpensive. 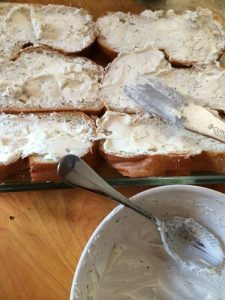 Mix the cream cheese, 1/4 cup Mayo, and seasonings and lather on the bread slices. Cover with 1/2 cup of shredded cheese. Mix the meatballs, spaghetti sauce and water in a large bowl. You can use homemade meatballs and sauce but I was going for convenient so picked up a bag of frozen meatballs and organic sauce at the store. Spread over the Bread mixture. Cover with the rest of the cheese and bake uncover. No sweat right. Now you have 30 minutes to make a side salad or sit down for the first time today. When slightly cool you can serve up this bad boy and see what your family thinks. I was pretty impressed with the resemblance of a Meatball sub from a deli and this Meatball Sub Casserole. If you have a smaller family feel free to cut the recipe in half and make it in a smaller pan. 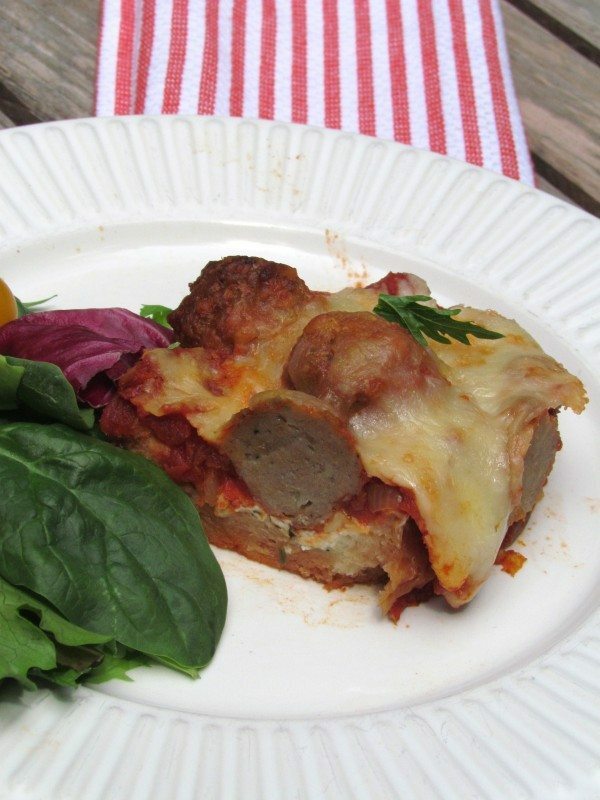 A great way to serve meatball subs to a crowd with this inexpensive casserole recipe. Cut bread into 1 inch slices and place on bottom of a greased 9x13 pan. 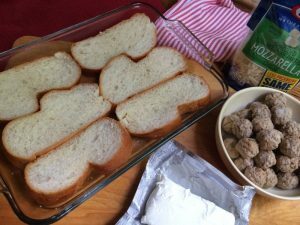 Mix the cream cheese and sasonings; spread over bread slices. Sprinkle with 1/2 cup cheese; set aside. 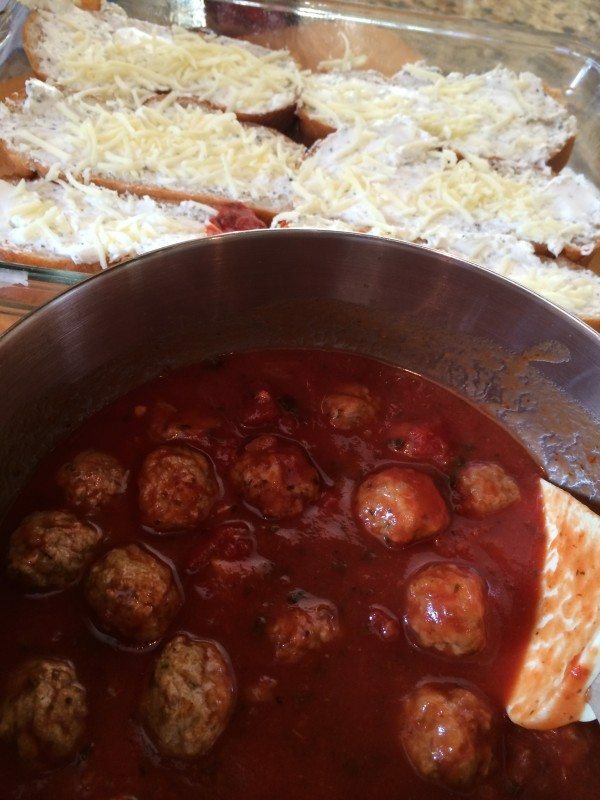 Gently mix together meatballs, spaghetti sauce and water; spoon over cheese. Sprinkle with remaining cheeses. Hope your family enjoys this as much as mine. Be sure to grab these Free Kraft Coupons printable at you home! Your kids are so lucky to have you as their mom. Having this great food already prepared as they come home truly is sweet! What an interesting idea! 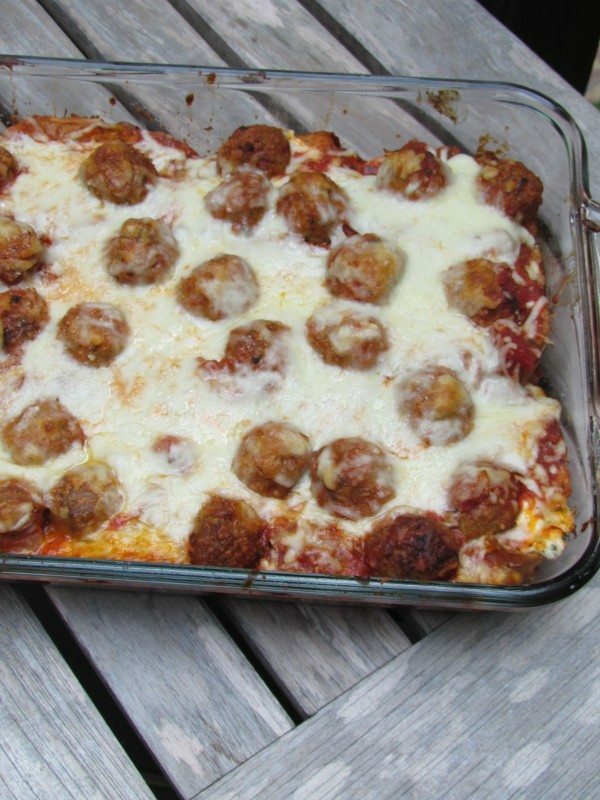 I would never have thought about making a meatball casserole. Looks tasty! I like that the ingredients are inexpensive! Never thought about turning subs into a casserole. Starting out with a fork a knife would be a great way to eliminate some of the mess of a meatball sub. Oh that sounds and looks delicious! I’m going to have to tuck that away in my recipe binder for another day! 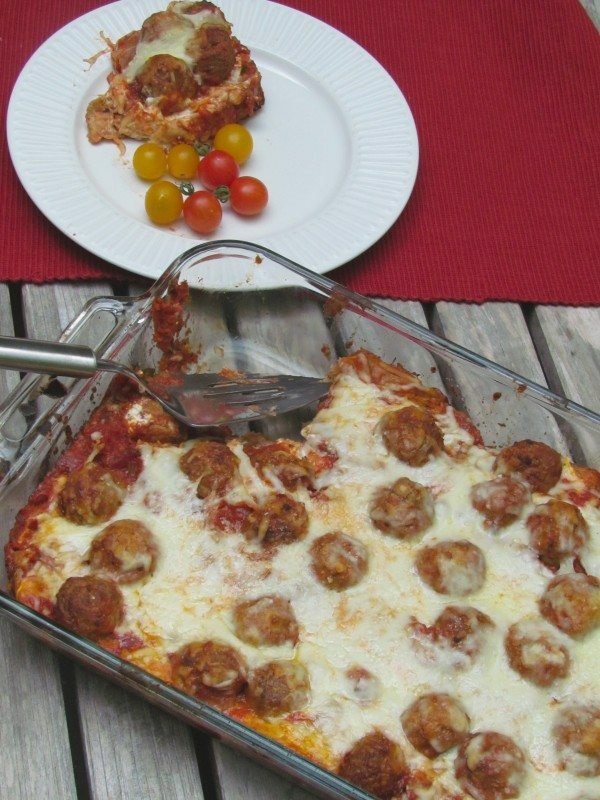 This meatball sub casserole sounds delicious! Any time you can convert any food into a casserole, it’s going to be delicious. 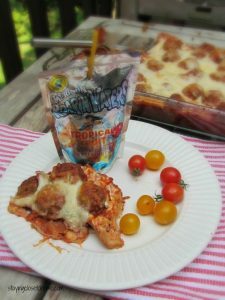 Wow that’s one delicious looking meatball sub casserole! I would love to try it. Sounds like a great recipe! Thanks for all the awesome coupons, I will have to try it out! Wow that looks so good! I love how you put the bread on the bottom. I have to try this. The meatball sub casserole sounds great! I am looking for a ton of new recipes right now as I need to start cooking more. Thanks for a great idea! thats looks yummiiee! !..thanks for sharing.. I don’t have bread often but Italian bread is so good. I can eat almost a whole loaf from.this bakery I buy mine at haha. This looks so yum! My sons would enjoy.